Geoffrey Swain has produced a robust, highly readable and fresh look at Trotsky that provides new insights into his personality, life, career and political ideas. Trotsky comes out as a more human and rounded figure than in many other biographies but, at the same time, Swain emphasises his ruthlessness. He gives no comfort to romantics who sentimentalize Trotsky as a more restrained alternative to Stalin. Professor Christopher Read, Universityof Warwick There is no disputing Trotsky's significance as a revolutionary. Without him there would have been no October Revolution, no Bolshevik victory in Russia's Civil War and ultimately no Soviet Union. This biography offers a new interpretation of Trotsky's career. Rather than the traditional focus on the years in opposition and exile, it concentrates on Trotksy's years in power: his pre-Revolutionary life, his role during the 1917 revolution and subsequent civil war, and his part in constructing the new soviet state. Geoffrey Swain uses previously unexplored archival material to provide a full account of Trotsky's years in power. He examines the origin and meaning of the theory of permanent revolution and critiques Trotsky's misconceived analysis of post-revolutionary society. He goes on to assess Trotsky's claims as organiser of the October Revolution, and analyses in detail Trotsky's role in founding the Red Army. Swain also shows how Trotsky's ideas on military organisation became the basis for his vision of a future socialist society and at the same time sowed the seeds for his post-war disagreements with Lenin. 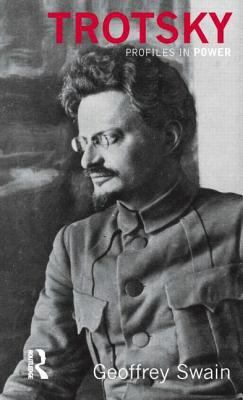 The study includes an examination of Trotsky's tense relationships with both Lenin and Stalin, concluding that his continued adherence to the idea of permanent revolution meant he fatally misunderstood the nature of the struggles taking place around him. Professor Geoffrey Swainholds the Alec Nove Chair in Russian and East European Studies at the Universityof Glasgow. He has written numerous books and articles on the history of Russia and Eastern Europe, including Russian Social Democracy and the Legal Labour Movement, 1906-14(Macmillan 1983), The Origins of the Russian Civil War(Longman 1996), Russia's Civil War(Tempus 2000) and Between Stalin and Hitler: Class War and Race War on the Dvina, 1940-46(2004).Swain, Geoffrey is the author of 'Trotsky', published 2006 under ISBN 9780582771901 and ISBN 0582771900. Loading marketplace prices 4 copies from $11.98 How does the rental process work?